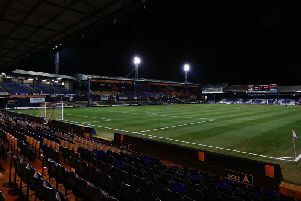 Hatters striker Danny Hylton knows that the decision to put Andrew Shinnie on the bench for Saturday’s trip to Crewe Alexandra is a clear indication of the quality of squad in place at Kenilworth Road this term. The on-loan Birmingham City midfielder had impressed while starting in the 7-0 win over Cambridge the previous weekend and then followed that up with his first league goal as Town saw off Carlisle 3-0. However, he was back on the bench at the weekend as Town changed shape, before coming on after the hour mark and inspiring Hatters to their third win in a week by setting up Luke Berry’s decisive strike in the 2-1 win. Hylton said: “Shins has probably been our best player over the last two or three games and found himself not starting which was a bit unlucky, but that’s why we’ve got the squad we have. “He came on and changed the game for us, and he did very well for Bez’s goal. “When you’re in the team you really can’t take it for granted because there’s a player just as good as you on the bench that’s out of the team, that’s ready to take your shirt. When you’ve got the shirt you have to try and do the business, as there’s someone that will come in and take your shirt and do just as well. “It’s great competition and when you’ve got the shirt you have to try and do the business, as there’s someone that will come in and take your shirt and do just as well. “So it makes for good competition, healthy competition and when you’ve got the shirt, try and keep it as someone’s waiting to come in. Hylton himself was on target with his 12th goal of the campaign, although admitted he hadn’t been best pleased with his own display. The forward continued: “It was with my left foot and I just tried to get good contact on. “I’m not really too pleased how I played, it was a tough game, I thought they were quite aggressive, I probably didn’t play well, my touch, but I won’t go into it. “It was just a bit of a relief that it went in and we kicked on from there. “Crewe made it very hard, the conditions just added to that, although we’ll look back and say it wasn’t a great first half of football, it was important we didn’t concede, was important we didn’t lose concentration, just dug in and battled for that 45 minutes. The goal was all down the work of Elliot Lee who drove to the byline before cutting the ball back for Hylton to do the rest. Town’s leading marksman has been hugely impressed with the impact of his team-mate since getting his chance in the absence of the injured James Collins, adding: “Elliot, he’s been patient and he’s come in the team and he’s been phenomenal. “Every single game he’s played, I think he’s been amazing, he’s been a breath of fresh air and he’s been great. “So I’m really enjoying playing with him, same with Corndog (Harry Cornick) on the right too.